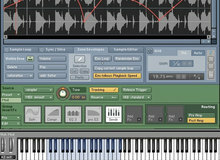 The UVI Workstation has been updated to version 2.6.4. Friday's Freeware: Loop me up ! Every week, Audiofanzine will highlight a free plugin or software for you to experiment during the weekend. Today, we introduce the Giada sampler. xoxos has released Element, a loop modulating wav player (a.k.a. "sampler") which loads a single 8-, 16- or 24-bit wav.